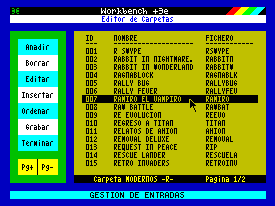 Workbench + 3e is a graphical user interface for ZX Spectrum designed for easy access to your programs stored on a hard disk. You can organize the installed software in a logical and orderly manner and load it from the simple and intuitive environment. The +3e ROMS provide powerful commands for using IDE drives however because of thedesign limitations inherent it leads to an absence of subdirectories and the short filename can make the process of storing and executing software both complexand arduous. 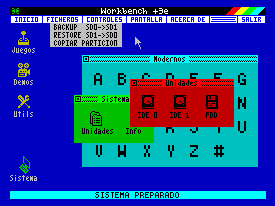 With Workbench +3e just have to boot your computer and select the LOADER option and you will have a graphical environment that lets you access your programs clearlyand easily where you can then load them with a few simple clicks of the mouse. You can also use Workbench +3e to browse through the contents of your hard drives. Workbench +3e also Includes utilities for copying files and managing hard disk backups plus you can also use it when restoring your backups at a later date. Workbench +3e automatically detects whether it is running on a ZX-UNO and will take advantage of the CPU’s turbo modes and increase the execution speed of the environment without affecting its compatibility with games and programs. ZX Spectrum +2a/+3 or ZX-UNO. Storage interface supported by +3e ROMS (Divide, DivMMC, ZX-MMC.....). Kempston Mouse or Sinclair Joystick interface. Workbench +3e can be controlled by mouse or joystick. Mouse: Compatible with interfaces that meets Kempston Mouse protocol. Joystick: Compatible with Sinclair joystick interface. Connect the joystick in port 1. - Games window contains two new folders: MODDING and OTHERS. - Modern folder increases its capacity and now works in the same way as the Classics folder, with subfolders to organize the entries in alphabetical order. Fixed error displaying directories that causes a crash when trying to visualize the contents of a partition with more than 221 files. Now you can see the maximum number of files that +3IDEDOS allows to contain for each folder(512 files). Removed access to the RAM drive that is replaced by Disk Drive A. New preinstalled software collection, ready to be executed. Revised all graphical icons to enhance their appearance. Version 2.0a corrects failure when booting application with english language selected from initial 2.0 version. Input mode: The alternative version of input by keyboard is eliminated and control of the mouse pointer by joystick is enabled. Output window: New button ASIG to visualize files of the related partition and add them to folder. Folder editor: The "File type" field is deleted. Now the system automatically recognizes file type. - DRIVES icon: File explorer for IDE 0, IDE 1 and RAM drives. ZX-UNO: Program automatically detects if it runs on a ZX-UNO to accelerate processes using turbo CPU modes. Languaje: Configurable in Spanish and English. Screen Saver: Integrated on desktop to avoid classic monitors damages. Setup: The installation program is now called SETUP and displays texts in Spanish or English. Includes the language configuration, the default control method and the number of intalled IDE units. User manual: User manual available in Spanish and English. Generalized execution speed improvement. Code rewritten and 100% compiled. Same features of the previous version except the UNITS window that lacks functionality. First functional version. Fully developed in pure BASIC. Presented at RUN ZX 2018 in Madrid. [HDF empty] version: Same as HDF version but without any software included, so you can start your own compilation. [DSK version]: Insert the disk in drive A, select option +3 BASIC. Set A as default unit with LOAD "a:" and run LOAD "setup". Installation program will perform all necessary operations and guide you through the process. Caution: All data on IDE unit 0 will be deleted. 3e v.0.5 alpha + StrowSaw: File manager for +3e IDEDOS drives. Allows transfer files between PC and Spectrum. Works with IDE physical drives and disk images. Drive Image 1.07: Program to transfer HDF disk images to physical disks or vice versa. 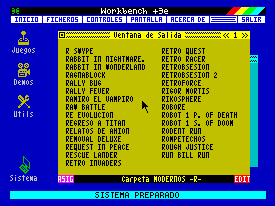 ROMS +3e para ZX-UNO: .TAP files to load +3e ROMS (v.1.43) on ZX UNO and run Workbench +3e. 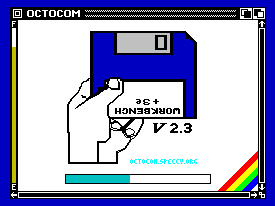 ZX Spectrum +3e Homepage: +3e project main page with all the documentation and downloads. ForoFPGA about MYST: Detailed information Informacion detallada and all the necessary software to use Workbenck +3e in a MYST (created by desUBIKado). Antonio Villena for give us a ZX-UNO for development and testing. "In memory of Pumu that accompanied me throughout the creation process of this program but could not get to see it finished"